"Abacas" redirects here. It is not to be confused with Abacus. Musa abaca Perr. nom. inval. Abacá (/ɑːbəˈkɑː/ ah-bə-KAH; Filipino: Abaka [aβaˈka]), binomial name Musa textilis, is a species of banana native to the Philippines, grown as a commercial crop in the Philippines, Ecuador, and Costa Rica. The plant, also known as Manila hemp, has great economic importance, being harvested for its fiber, also called Manila hemp, extracted from the leaf-stems. The plant grows to 13–22 feet (4.0–6.7 m), and averages about 12 feet (3.7 m). The fiber was originally used for making twines and ropes; now most is pulped and used in a variety of specialized paper products including tea bags, filter paper and banknotes. It is classified as a hard fiber, along with coir, henequin and sisal. The abacá plant is stoloniferous, meaning that the plant produces runners or shoots along the ground that then root at each segment. Cutting and transplanting rooted runners is the primary technique for creating new plants, since seed growth is substantially slower. [nb 1] Abacá has a "false trunk" or pseudostem about 6–15 inches (15–38 cm) in diameter. The leaf stalks (petioles) are expanded at the base to form sheaths that are tightly wrapped together to form the pseudostem. There are from 12 to 25 leaves, dark green on the top and pale green on the underside, sometimes with large brown patches. They are oblong in shape with a deltoid base. They grow in succession. The petioles grow to at least 1 foot (30 cm) in length. When the plant is mature, the flower stalk grows up inside the pseudostem. The male flower has 5 petals, each about 1.5 inches (3.8 cm) long. The leaf sheaths contain the valuable fiber. After harvesting, the coarse fibers range in length from 6–12 feet (180–370 cm) long. They are composed primarily of cellulose, lignin, and pectin. The fruit, which is inedible and is rarely seen as harvesting occurs before the plant fruits, grows to about 2–3 inches (5.1–7.6 cm) in length and 1 inch (2.5 cm) in diameter. It has black turbinate seeds that are 0.167 inches (0.42 cm) in diameter. The abacá plant belongs to the banana family, Musaceae; it resembles the closely related wild seeded bananas, Musa acuminata and Musa balbisiana. Its scientific name is Musa textilis. Within the genus Musa, it is placed in section Callimusa (now including the former section Australimusa), members of which have a diploid chromosome number of 2n = 20. Before synthetic textiles came into use, M. textilis was a major source of high quality fiber: soft, silky and fine. Ancestors of the modern abaca are thought to have originated from the Eastern Philippines where there are lot of rains (no pronounced dry season), in fact wild type of abaca can still be found in the interior forests of Catanduanes Island which is often not cultivated. Today, Catanduanes has many other modern kinds of abaca which are more competitive. For many years, breeders from various research institutions have made the cultivated varieties of Catanduanes Island even more competitive in local and international markets. This results in the optimum production of the island which had a consistent highest production throughout the archipelago. Europeans first came into contact with Abaca fibre when Magellan made land in the Philippines in 1521, as the natives were cultivating it and utilizing it in bulk for textiles already. By 1897, the Philippines were exporting almost 100,000 tons of abacá, and it was one of the three biggest cash crops, along with tobacco and sugar. In fact, from 1850 through the end of the 19th century, sugar or abacá alternated with each other as the biggest export crop of the Philippines. This 19th century trade was predominantly with the United States and the making of ropes was done mainly in New England, although in time the rope-making was moved back to the Philippines. Excluding the Philippines, abacá was first cultivated on a large scale in Sumatra in 1925 under the Dutch, who had observed its cultivation in the Philippines for cordage since the nineteenth century, followed up by plantings in Central America in 1929 sponsored by the U.S. Department of Agriculture. It also was transplanted into India and Guam. Commercial planting began in 1930 in British North Borneo; with the commencement of World War II, the supply from the Philippines was eliminated by the Japanese. In the early 1900s, a train running from Danao to Argao would transport Philippine abaca from the plantations to Cebu city for export. The train and tracks were destroyed during the Second world war, however the Abaca plantations continue and are now transported to Cebu by road. After the war, the U.S. Department of Agriculture started production in Panama, Costa Rica, Honduras, and Guatemala. Today, abacá is produced commercially in only three countries: Philippines, Ecuador, and Costa Rica. The Philippines produces between 85% and 95% of the world's abacá, and the production employs 1.5 million people. Production has declined because of virus diseases. Due to its strength, it is a sought after product and is the strongest of the natural fibers. It is used by the paper industry for such specialty uses such as teabags, banknotes and decorative papers. It can be used to make handcrafts such as bags, carpets, clothing and furniture. Abacá rope is very durable, flexible and resistant to salt water damage, allowing its use in hawsers, ship's lines and fishing nets. A 1 inch (2.5 cm) rope can require 4 metric tons (8,800 lb) to break. Abacá fiber was once used primarily for rope, but this application is now of minor significance. Lupis is the finest quality of abacá. Sinamay is woven chiefly from abacá. The inner fibers are used in the making of hats, including the "Manila hats," hammocks, matting, cordage, ropes, coarse twines, and types of canvas. It is called Manila hemp in the market although it is unlike true hemp, and is also known as Cebu hemp and Davao hemp. Abacá cloth is found in museum collections around the world, like the Boston Museum of Fine Arts and the Textile Museum of Canada. drying (usually following the tradition of sun-drying). When the processing is complete, the bundles of fiber are pale and lustrous with a length of 6–12 feet (1.8–3.7 m). In Costa Rica, more modern harvest and drying techniques are being developed to accommodate the very high yields obtained there. According to the Philippine Fiber Industry Development Authority, the Philippines provided 87.4% of the world's abaca in 2014, earning the Philippines US$111.33 million. The demand is still greater than the supply. The remainder came from Ecuador (12.5%) and Costa Rica (0.1%). The Bicol region in the Philippines produced 27,885 metric tons of abaca in 2014, the largest of any Philippine region. The Philippine Rural Development Program (PRDP) and the Department of Agriculture reported that in 2009-2013, Bicol Region had 39% share of Philippine abaca producution while overwhelming 92% comes from Catanduanes Island. Eastern Visayas, the second largest producer had 24% and the Davao Region, the third largest producer had 11% of the total production. Around 42 percent of the total abaca fiber shipments from the Philippines went to the United Kingdom in 2014, making it the top importer. Germany imported 37.1 percent abaca pulp from the Philippines, importing around 7,755 metric tons (MT). Sales of abaca cordage surged 20 percent in 2014 to a total of 5,093 MT from 4,240 MT, with the United States holding around 68 percent of the market. Abacá is vulnerable to a number of pathogens, notably abaca bunchy top virus and abaca bract mosaic virus. ↑ A plant grown from a shoot takes three years to maturity; while a plant grown from a seed takes 4 years to maturity. ↑ Tampos, Nikki. "What happened to Cebu's old train?". www.everythingcebu.com. Everything Cebu. Retrieved 18 November 2016. ↑ Palmera, Erica Jean. "The Sugbo railway". www.rafi.org.ph. RAFI. Retrieved 18 November 2016. ↑ "Abaca cloth". Retrieved 2015-09-01. ↑ "Textile Museum of Canada Collection and Exhibitions | Textile Museum of Canada Collection and Exhibitions". collections.textilemuseum.ca. Retrieved 2015-09-01. 1 2 3 4 5 6 7 "PH biggest abaca exporter | Malaya Business Insight". Malaya Business Insight. June 15, 2015. Agricultural Research Service (23 May 1995). "Taxon: Musa textilis Née". USDA Germplasm Resources Information Network. Archived from the original on 10 June 2014. Retrieved 10 June 2014. Anon (2013). "Musa textilis Née". The Plant List. Archived from the original on 4 June 2014. Retrieved 4 June 2014. Anon (2013a). "(Research) Plant Molecular Biology and Plant Virology". National Institute of Molecular Biology and Biotechnology. Archived from the original on 4 June 2014. Retrieved 4 June 2014. Bailey, L. H., ed. (1947) . "Abacá". The Standard Cyclopedia of Horticulture. I: A-E. New York, NY: The Macmillan Company. Borneman, Jr., John A. (1997). "Abaca". In Johnston, Bernard. Collier's Encyclopedia. I: A to Ameland (1st ed.). New York, NY: P. F. Collier. Considine, Douglas M.; Considine, Glenn D., eds. (1983). "Abaca". Van Nostrand's Scientific Encyclopedia. I: A-H (6th ed.). New York, NY: Van Nostrand Reinhold Company. ISBN 0-442-25164-5. Gove, Philip Babcock, ed. (1976). "Lupis". Webster's Third New International Dictionary (3rd ed.). Springfield, MA: G. & C. Merriam Company. ISBN 0-87779-101-5. Gove, Philip Babcock, ed. (1976a). "Sinamay". Webster's Third New International Dictionary (3rd ed.). Springfield, MA: G. & C. Merriam Company. ISBN 0-87779-101-5. Hoiberg, Dale H., ed. (2010). "Sbaca". Encyclopædia Britannica. 1: A - ak Bayes (15th ed.). Chicago, IL: Encyclopædia Britannica Inc. ISBN 0-85229-961-3. Ploetz, Randy C.; Kepler, Angela Kay; Daniells, Jeff & Nelson, Scot C. (2007). 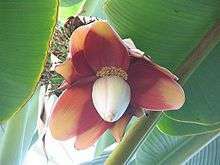 "Banana and Plantain: An Overview with Emphasis on Pacific Island Cultivars". In Elevitch, C. R. Species Profiles for Pacific Island Agroforestry. www.traditionaltree.org. Hōlualoa, HI: Permanent Agriculture Resources (PAR). pp. 1–27. Archived from the original (PDF) on 4 June 2014. Retrieved 4 June 2014. Seekins, Donald M. (1993). Dolan, Ronald E., ed. Philippines: A Country Study. Washington, DC: United States Government Printing Office. ISBN 0-8444-0748-8. Wong, Carol; Kiew, Ruth; Argent, George; Set, Ohn; Lee, Sing Kong & Gan, Yik Yuen (2002). "Assessment of the Validity of the Sections in Musa (Musaceae) using ALFP". Annals of Botany. 90 (2): 231–238. doi:10.1093/aob/mcf170. Wood, Frances A.; Roberts, George A. F. (2005). Prance, Ghillean; Nesbitt, Mark, eds. The Cultural History of Plants. New York, NY: Routledge. ISBN 0-415-92746-3. Worcester, Dean C. (1899) . The Philippine Islands and Their People. New York, NY: The Macmillan Company. Wikimedia Commons has media related to Musa textilis. Wikisource has the text of the 1911 Encyclopædia Britannica article Abaca. The World Book encyclopedia set, 1988. Christenhusz, M.J.M. (2009). Typification of ornamental plants: Musa textilis (Musaceae). Phytotaxa 2: 53-54.